My name is Francesca. I am from Italy and I am a student at Bocconi University. I am studying Economics for the Arts, and my passion for cinema brought me to become an intern at the Oregon Film Office this summer. As an intern and a student, I will have the opportunity to attend a special event: the screening of “Anonymous,” Roland Emmerich’s latest movie. In fact, The Concordia University Shakespeare Centre will bestow the “Vero Nihil Verius Award of Artistic Excellence” to Roland Emmerich during their annual conference (September 6th 2011 -9th 2011). 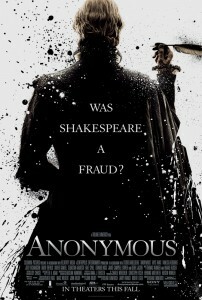 Moreover, on September 7th in downtown Portland, there will be a screening of Emmerich’s upcoming movie “Anonymous” followed by a discussion between the director and a panel of Shakespeare’s scholars. As a student of theatre and cinema, I am looking forward to attending this special event because it will be a unique opportunity. In fact, “Anonymous” tackles a very interesting question: is Edward De Vere, the 17th Earl of Oxford, the real author of Shakespeare’s plays? Personally, I have always asked myself if it would be possible that all the works assigned to Shakespeare were actually written by him, and I recently discovered that there are many different theories. It looks as if it will be a suspenseful movie, and watching it before it will be released in theatres is exciting! Roland Emmerich will be there to introduce the film and give a Q and A afterwards. Emmercih has directed movies as, “The Day After Tomorrow”, “2012” and “Independence Day”- it is a very rare opportunity to hear him speak about this latest film. Oregon Film still has 4 tickets for students that want to attend this special event, so, who wants to join me? If you are interested and are a student, contact the film office for more information.